Many women don’t realize it’s possible to have a baby after menopause. Societal norms are driving more and more women to delay pregnancy, sometimes until they reach their forties or fifties! Frozen donor eggs have made it possible for a postmenopausal woman to achieve a successful pregnancy at the same rate as a woman in her twenties or thirties. Let’s explore common questions about donor egg pregnancy and menopause. HOW COMMON IS POSTMENOPAUSAL PREGNANCY? Whether you have postponed starting a family to pursue your career and/or higher education or you wish to grow your family with a new spouse, postmenopausal pregnancy is very much possible with frozen donor egg! A recent study shows that more than 40% of women in the U.S. believe it is advantageous for career-minded women to hold off on having children until they reach their forties, and with a 2% rise in IVF for women over the age of fifty between 2013 and 2014, statistics show that postmenopausal pregnancy is a practice that is gaining ground. Studies have shown similar risk factors between pre- and postmenopausal women, with about the same incidence of complications such as gestational diabetes. In any case, as long as the woman is healthy in every other way, it should be possible for her to carry a child to term. A postmenopausal woman using her own eggs to become pregnant would be risky for several reasons, mainly because there is a higher risk for chromosomal birth defects, stillbirth and other complications. Though it is possible for a woman to conceive any time before and even during menopause, the quality of her eggs declines significantly, and postmenopausal egg freezing is not a good option. With age, eggs accumulate potential issues, such as an increased risk for miscarriage, or chromosomal defects such as Down Syndrome. For women over forty, using a frozen donor egg can minimize these risks, as the donor has been prescreened and the eggs frozen during her peak fertility years thereby decreasing the likelihood of chromosomal defects. 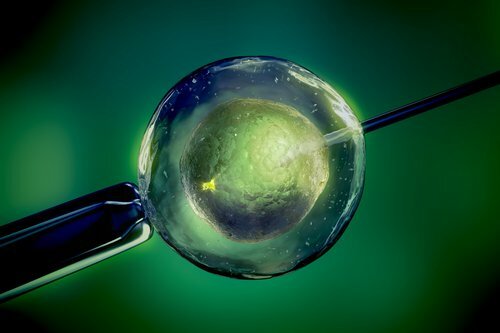 HOW CAN FROZEN DONOR EGGS IMPROVE MY CHANCES OF SUCCESS? Selecting frozen donor eggs is a sensible option, both from a medical and practical standpoint. Donors are rigorously tested for genetic and infectious diseases, and the extensive amount of information available about the donor themselves allows the intended parent to choose a donor based on the traits and values that are of most importance. The process of preparing the uterus to accept an embryo is much the same as it is for a woman in her twenties or thirties. For the woman who has already experienced menopause, there is a uterine rejuvenation process she must go through to prepare her womb for the embryo. Though the uterus atrophies considerably after menopause, estrogen and progesterone therapy can return the womb to a healthy state. Hormonal stimulation in this instance is more important than ever, as after menopause, the uterus can potentially shrink to a third of its normal size. In some women, the endometrial lining has thinned also, requiring an extended period of hormonal treatment prior to the IVF cycle to restore it to a size and thickness adequate to support a healthy pregnancy. An initial three-month period of cyclical estrogen/progesterone treatment prior to IVF therapy has been found to support a successful outcome. As each individual is different, your fertility specialist will be able to determine what course of treatment is best to prepare you for pregnancy. IS MY BODY FIT ENOUGH TO CARRY A CHILD? These days, a woman in her fifties is often in as good or even better shape than women fifteen or even twenty years her junior. But regardless of age, it is always recommended for the potential mother to bring her body to its absolute peak of wellness before beginning treatment that could lead to a pregnancy. While we don’t suggest it, the current world record for the oldest woman to give birth as a result of IVF is 72. One should consider the implications of having a baby at any age and ensure there is a strong support system for the child into adulthood should anything happen to the mother. For women who thought their “ship has sailed” with regard to raising a child of their own, this should come as very good news! If you're a perimenopausal, menopausal or postmenopausal woman and have a strong desire to bear children, talk to a fertility specialist about the possibility of conceiving with frozen donor egg. If you'd like more information on frozen egg donation, contact us today and find out more about Donor Egg Bank and what we can do to help make your dream of motherhood come true. Are you ready to find your perfect donor? Search our donor database and trust your instincts! Sounds Great to their are staffs and Donors to help people like us to help. Hope every thing works out. Believe it's worth it. God bless all of who is trying to start and build a family. Pray this will happen. Thank you for giving us hope. Gives a opportunity to be able bring home a baby. Have a great day. Thank you for this information and the statistics. We started our family while I was 44 and while we have twin boys, we still want to try for a girl. Here we are, over a year later and I worry if that time made a big difference or not. I truly needed to hear this so I wouldn't feel guilty about having my family at an older age. Looking to purchase frozen donor egg what is the procedure? Can I get an egg from someone who previously donated to ensure success? I am interested in an egg donor of indian decent, I was declined approval last year due to my credit history. I would like some more information. I have twins from eggs donated by a family member, but now I am in a new relationship with a man who lives kids but has none of his own. My concern about donor eggs is the fact that children from these eggs could have any number if half siblings anywhere. Is it possible to obtain donated eggs exclusively for my own? I read thru this and felt like hugging you all for the hope i have right now. I need to know if you can recommend a fertility clinic for me in the US for IVF. Thank you. I’m so happy to read this! I’m undergoing chemo for breast cancer at age 41 and a very unfortunate risk of tx is wary menopause which has made me so depressed as I really want another child. Hope!!! Thank you for this article, my girlfriend is 56 and will soon be in 57 and we are considering having baby. Can IVF be of help and if yes can she or I get any relative to donate egg for her or she can get her own egg herself. Thank you. Louise I had breast cancer 2014... I'm 51 years old and got married nearly three year's ago, My doctor says after cancer and menopause your body may start the cancer cells again if having IVF and that I shouldn't consider having a child as cancer can come back due too the estrogen and progesterone receptors may react.. My loving husband hasn't had children yet I don't know what to do now I feel the same way as u do ... I do hope you had your baby.. God bless all who are trying.. It's God who gives always remember that... My only hope is surrogacy I guess..